Nostalgia is an interesting phenomenon. When we reflect back, the tendency is to somehow ignore the ugly and focus on the good. Basic Training in the military, ah…what a great time that was. Tradition, physical conditioning, new friends, common goals, everything was great. Quickly forgotten was the four a.m. wake-up, hiking for miles with full packs, demeaning messages from a drill sergeant, sub standard meals, and of course the fear of being activated during a time of conflict or war. It is amazing how quickly we forget. Although the threat of being sent into combat is not part of the drill in kitchens, the forgotten “ugly parts” tend to fade from the conversation. During my early days in kitchens it is interesting to note that cooking was not a profession in America that drew much respect. True, there were pockets of solid cooking, primarily in hotel kitchens and a handful of classic French or Italian establishments, but for the most part, young people were not clamoring to choose a career in food and far too few operations were of the quality to excite new recruits. I was fortunate (again, remembering the good things) to work in a busy hotel kitchen, a place that I reflect back on with fond memories, but nevertheless, it was far from the kitchens of today. Allow me to paint a picture of what it was like, only 45 years ago. The hotel kitchen was in the sub-basement – that’s right, one level below the basement. Not a window to be had, no access to fresh air, no indication whether the sun was up or down. The focus was always on the work at hand. The hotel had 1,200 guest rooms, 18 banquet rooms (as small as space for 10 to as large as 2,000), and three restaurants. This property, the original Statler Hotel (later to become Statler Hilton), was the hub of the city and the most significant banquet hotel around. It was not uncommon to have 18 banquets taking place at the same time. There were other staging kitchens for banquets, but all of the cooking took place in the sub-basement. The Executive Chef was a seasoned veteran of the Hilton chain. The first chef that I worked with in this hotel came from the Queen Elizabeth in Montreal. He was born and trained in Austria. Later on, he left for a different property and his replacement was an Italian chef who began his career with the Statler as a line cook at this property. The butcher was from France. He refused to learn how to speak English so he communicated by waving his hands and pointing to the product he was fabricating. The pastry chef was from Italy and had worked at this hotel for 30 years, the saucier was also Italian who grew up in the ethnic neighborhoods of Buffalo, and the banquet chef was a home grown American with ten kids. The balance of the team was comprised of vagabond prep cooks, renegade line cooks, crazy dish and pot washers, and an occasional wannabe from hospitality-college (me). The service staff members for the restaurants had been at the hotel for a generation, while those who worked the hundreds of banquets every year were “rented” for events through a regional temp agency (they were hard as stone, technically competent, but raw and abrasive in demeanor). So, what about the quality of food and the focus on cuisine? I would like to say that it was exceptional; in reality it was simply OK. It was the organization and logistics surrounding the planning and execution of banquets that was most impressive. Serving hundreds and even thousands every day was quite a feat of planning. This is, for the most part, what the chef did. When it came time to cook, his job was orchestration, not cooking. He depended on his lieutenants (sous chef, pastry chef, banquet chef, butcher and garde manger) to manage production and flavor profiles. A prime rib banquet for 2,000 involved trimming, tying, seasoning and roasting 100 plus 109 ribs to a perfect rare and holding them in warming units until hand carving at service. Now we had two – triple stack deck ovens and twelve other under-range ovens (in rough shape after decades of use), so do the math. Roasting would begin as early as 6 am to make room for 2-3 shifts of ribs in those ovens. This is before rack-ovens; Alto Shams, holding ovens, convection ovens, and pre-tied 109 ribs. Everything was done from scratch. Au Jus, Bordelaise, Demi Glace were all prepared in 50-gallon steam kettles twice a week to handle all of the events. Young apprentices might be relegated to washing, poking, and foil wrapping bakers, chopping and washing parsley, dicing carrots and parsley, washing lettuce for thousands of house salads, or opening bushels of clams for casino hors d’ oeuvres. When it came time for plating, it was all hands on deck. Serving 2,000 in 30 minutes would require 3-4 serving lines each with a carver, multiple hands on other plate components and runners for each line to keep areas stocked with product so that the assembly line didn’t slow down. How was the food? Well, absolutely as good as you could expect. More often than not the dessert on banquets was either Baked Alaska (lights turned off, flambé with sugar and hot brandy and paraded around the dining room), or Peach Melba – a contribution passed down from Escoffier himself. The signature of both of these was that the short Italian pastry chef made all of the ice cream, poached the fresh peaches, and simmered fresh raspberries for the Melba sauce. How important was the craft of cooking in those days? 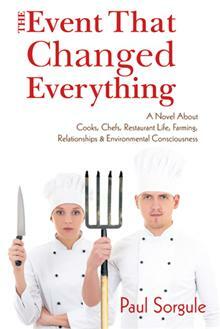 Well, there is no question that the long-time cooks and chefs had great skills, but was cooking really their passion? Were they cooking out of a love of the craft and respect for the ingredients? I can’t really say that this was the case. Fast-forward to today and cooks and chefs are in a far better place. 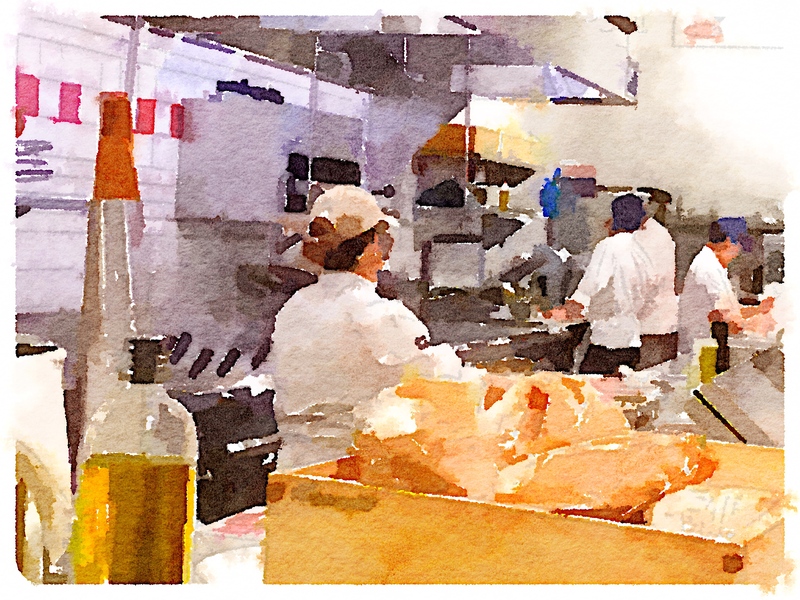 The dynamic of the kitchen may be similar, however the commitment of the cook, the passion that many share for what they do, the connection to the ingredients and the desire to create has improved exponentially. People choose to be involved in the business today at a rate that would have been hard for my mentors to contemplate. Customers are far more aware of what they eat, very connected to the impact that food has on their well-being, truly interested in those who cook for a living, and excited to dine out with high expectations of an experience, not just a chance to satisfy their hunger. Some things don’t change: the work is physically and emotionally hard, the demands are relentless, the stress is still mind-numbing, and the compensation has never caught up to the commitment of hours and effort. Many burn out from the environmental conditions just as they did forty some years ago, and chefs can humble and sometimes humiliate young cooks just as they did in the 1,200 room Statler hotel. What is truly different is the enthusiasm that true professional cooks have for the position they hold and the appreciation that guests have for the craft. Is it better today than in the past? If all of my friends who boast from the same generation of cooks that I am a part of think back and try to remember the ugly as well as the good, I think they might agree that dedicating your life to a career in food is far more satisfying today. I have been in the industry for over 32 years, I can say I truly related to this. It brought up a lot of memories that has made me into the chef I am today. As I have opted to go back and continue my education in the industry, I have seen the transformation. Thank you so much for taking me back down memory lane.